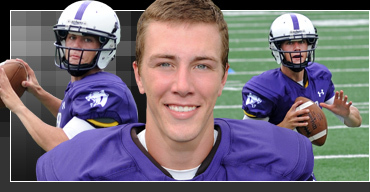 Congratulations to Elder senior QB Peyton Ramsey who was named the LaRosa’s MVP of the Week! Elder senior Peyton Ramsey is headed to Indiana University on a football scholarship, but before that he has in front of him his senior year as the Panthers’ quarterback. So far in his prep career, Peyton has thrown for 4,019 yards and 25 TDs, and has rushed for 1,460 yards and 17 TDs. Son of Panthers’ head coach Doug Ramsey, Peyton last season as a junior passed for 2,062 yards (13 TDs) and rushed for 908 yards (12 TDs). He earned numerous honors, including being named GCL South Co-Player of the Year, 1st team all-city, 1st team Southwest Ohio and special mention all-state. Also playing basketball for last year’s 22-3 sectional champs, Peyton averaged 8.2 ppg.-4 rpg. and was named 1st team GCL South, a Community Press all-star and honorable mention all-SWO District. A National Honor Society student (4.0 GPA), Peyton’s favorite athlete and most-like-to-meet is Aaron Rodgers, favorite entertainer is Kenney Chesney, favorite book is Toughness and favorite movie is Friday Night Lights.